The CLS-200 is a revolutionary design that replaces the carrier conveyor chains with precision cams. 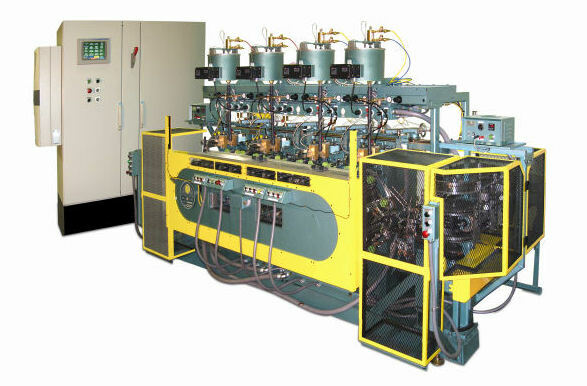 The complete 2nd generation drive system utilizes high performance synchronous timing belts. The elimination of chain stretch, metal-to-metal contact, tension adjustments or need for lubrication provides smooth continuous operation with low maintenance. With this new design advancement, a CLS-200 can decorate a typical 12 oz container with color-to-color registration accuracy of +/- 0.2 mm and speeds up to 200 bpm. They are available in left-to-right or right-to-left configuration which optimizes floor space and manpower when multiple decorators are used. 304.8 mm. 76.2 mm. 76.2 mm. 44.45 mm. 76.2 mm. 26.975 mm. Return to Strutz International, Inc.